Our final project newsletter. It contains an article about our demo site in Norway, Hoffselva, and an interview with the Hoffselva project leader Herman Helness. 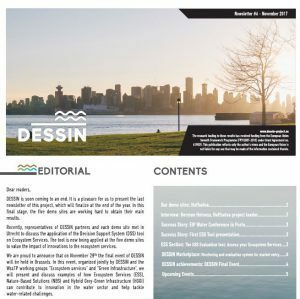 Futhermore, you can read about DESSIN’s participation at the EIP Water Conference in Porto and the first Ecosystem Services (ESS) tool presentation. The ESS tool is explained in detail, especially focusing on the monitoring and evaluation system for market entry.